Picture 14B-10. The Illinois Traction System experimented with alternating current (AC) power distribution in the building of its Peoria-Bloomington line, 1905-1907. This was less expensive to build, but turned out to be more expensive, and more trouble, to operate. One problem is that city trackage was still direct current (600 volts DC), so the cars for this service had to operate on either power. Cars 350-359 were built by the American Car Co. in 1907 for this service. 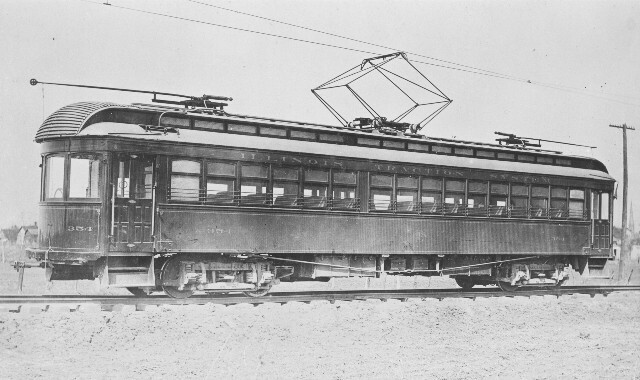 Here is car 354 as originally equipped, with a pantograph for AC current collection, and trolley poles for DC. By 1909, the experiment was abandoned, and the AC cars were rebuilt for straight DC power.